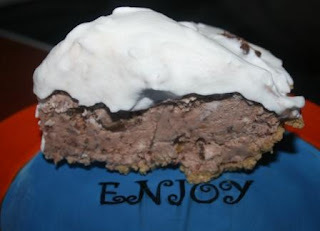 Two Bears Farm and the Three Cubs: Frozen Milky Way Mousse Pie - with Nutella! Frozen Milky Way Mousse Pie - with Nutella! This recipe was in my Woman's World magazine, and it is so incredibly delicious! And very bad for you. But worth it for a splurge here and there (I made it for Paul on our anniversary). In bowl, whisk together sweetened condensed milk and Nutella until blended. On medium-high speed, beat 1 1/3 cups cream until soft peaks form. Fold into chocolate mixture. Stir chopped candy bars into mousse mixture. Transfer 2 cups to a freezer-proof bowl. Spread remaining mixture in pie crust; freeze pie and reserved filling for 1 hour. Mound reserved filling over top of pie. Cover pie; freeze until filling is set, about 8 hours. On medium high speed, beat remaining 1 cup of cream until soft peaks form. Spread whipped cream over pie. If desired, garnish with additional sliced candy bars. That looks too yummy for me to make...I'd eat the whole thing!